The EU referendum matters for Global Justice Now. Here’s why. We spend our time fighting against EU policies. But now, we're campaigning to stay in. Do you want to be ruled by an undemocratic commission, captured by big business, imposing brutal austerity on southern Europe and pushing toxic trade deals? Or would you prefer to live in an offshore centre of unregulated finance, a human rights free zone, closed to immigrants, tinged with racism? It’s not surprising that so many campaigners are so unenthusiastic about the EU referendum. Of course, we want neither of these options. But at the same time, we can’'t ignore a referendum which will profoundly affect our campaigns and our ability to create a better world. This is too important to leave to David Cameron and Nigel Farage. So as we try to break open this debate, we also need to assess the real impact of a Brexit on our work. 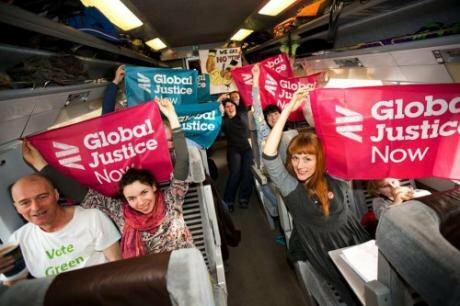 And the conclusion Global Justice Now’s members have come to, is that we must stay in the EU in order to change it. Europe’s current trajectory is unsustainable. Climate change, austerity, war and inequality. It has to change. We want to make sure it changes for the better. It is possible to imagine a Europe which is truly democratic, which promotes equality, which is a world leader on environmental protection, which respects and empowers workers, which makes the world a fairer place, which welcomes migrants. But it’s going to take some work. We’re a very long way from this Europe. Just look at the US-EU trade deal TTIP. TTIP is the EU at its very worst: an unelected commission pushing forward a deeply unpopular treaty, member states hiding behind secrecy to pretend another country is the problem, corporations shouting in the ear of commissioners. If we left the EU, we might be free of TTIP, though this is dependent on the transition arrangement which would be negotiated by the British government and the Commission. But what would replace it? British governments have consistently pushed the EU to the right, urging on ever more ‘free market’ policies. In fact, while Germany and France were concerned about the corporate court system in TTIP 18 months ago, the UK secretly wrote to the Commission president demanding he retain that mechanism in the negotiations. High profile supporters of the ‘out’ campaign have repeatedly said that they believe the UK would be able to realise a more ‘ambitious’ and a faster free trade deal if we stood alone. And we wouldn’t have the millions of German, French, Spanish and Polish campaigners alongside us trying to stop this toxic deal. If being in the EU has brought us TTIP, it has also brought us the movement capable of stopping it. On a number of other issues, the EU has tended to ensure better policies than the UK would otherwise have adopted. Environmental protection and financial regulation remain far too weak, but almost certainly better than British governments would have adopted alone. Indeed the weakness of Europe’s financial regulation is primarily a result of British governments desire to protect the privileges of the City of London. David Cameron’s most recent renegotiation was centred around protecting financial privileges and attacking workers and migration rights. This has been greeted with horror by our campaigning allies across the EU who continue to oppose Britain’s latest push to the right in Europe, as will we. But it’s on freedom of movement that the EU has most clearly delivered something positive. While it has come under unrelenting pressure from the right wing, freedom of movement has begun to erode the fact that a person’s rights and future depend upon where they were born. Of course, it is still only a small part of the world where we really have access to this freedom, but it’s a first step, which can be built on. Our recent briefing argues that this right should be universal. The migration ‘crisis’ in the EU means this right, and Europe’s responsibility to the rest of the world, is under threat. We face a dark period in Europe: refugees being fired on with teargas at borders, NATO ships turning back desperate people in the Mediterranean and the contracting out of our international duties to the increasingly authoritarian Turkish government. It’s difficult to see how Brexit will make this situation better. Britain helped scupper a deal which would have seen a fairer allocation of refugees across Europe. Such a deal could have undermined this crisis. At best, Brexit means burying our head in the sand and saying ‘it’'s someone else’'s problem’. At worst, it reinforces the turn to nationalism and disintegration which will end the hope of global freedom of movement for a generation. The EU’s food and energy policies have been rightly criticised. The Common Agricultural Policy is almost a synonym for waste, supporting Britain’s richest landowners at the expense of the poorest. Europe’s energy policies puts human rights to one side as we scour the world for control of the very fossil fuels that threaten our existence. This is all true. But Europe’s food policy was intended to ensure food security and support Europe’s producers. It needs radical reform, but let’s not throw the baby out with the bath water and give the free market even more power over our food system. The EU’s energy policy is a disgrace, but there are signs that people are fighting for something different. Especially in Germany, the campaign for energy democracy has inspired people right across Europe, and cooperation will strengthen the building of publicly controlled energy systems across the continent. We spend a huge proportion of our time campaigning to change the EU. We understand the democratic black hole that exists at its centre, and the injustices that European institutions perpetuate around the world. No campaigner can have witnessed the brutal blackmail forced on Greece last summer without questioning the EU. Supporting an alternative ‘in’ position in no way justifies the policies of the EU. We have real sympathy for those members and allies who want to Brexit, not because they’re nationalist but because they see a rupture with the EU as the only way to return democracy to Europe. We share common principles of internationalism, respect for human rights and equality, anti-racism and a commitment to democracy. We want to engage in respectful debate and, after the referendum, whatever the result, we will work together to build something better. Our commitment to the EU is far from unconditional. In the words of Yanis Varoufakis, former Greek finance minister, the EU faces a choice: democracy or disintegration. Perhaps the EU will ultimately prove unreformable. But our desire to cooperate with others - working for food sovereignty in France, energy democracy in Spain, and the ‘solidarity economy’ in Greece – leads us to believe we must try. British campaigners have taken an arms-length approach to Europe for too long. This doesn’t help successive British governments making the EU less democratic and less fair. We want to convince ordinary British people that our opponent is not German, Polish, or Greek people, but elites who have turned our continent and our world into their plaything, to be exploited for profit. We want to mobilise them to take it back. A victory for Brexit will not be a victory for those who share our values – rather it will be a triumph for nationalism, for those opposed to immigration, human rights and equality. Of course, a victory to remain will not necessarily be our victory either. But if we can use this campaign to build bridges with our allies, to mobilise for a different Europe, to connect our country to the broader movement for change, then the day of the referendum might be a starting point for something better. A modified version of this article first appeared in Ninety Nine, the magazine for supporters of Global Justice Now.